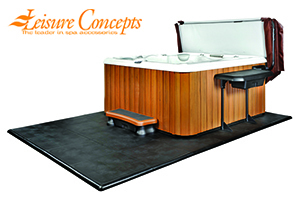 CSN is proud to partner with Leisure Concepts to provide a superior and complete range of high quality spa accessory products wholly manufactured in the U.S.A! Our stunning range of Accessories includes Spa Cover Lifters & Spa Steps for safety and style. The addition of luxury lifestyle products including Umbrellas, Spa Bars and Storage will provide enhanced experience in any Spa.